= Kotoshi wa seinansei no houkou wo muite taberundayo! 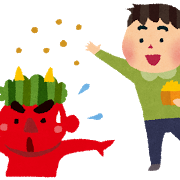 Today’s lesson is about 節分 ( = setsubun) and 方角 ( = hougaku)! February 3rd is called 節分 ( = setsubun) in Japan. 節分 ( = Setsubun) originally means “to divide seasons”. It’s the day before the first day of each season. But it only indicates February 3rd now. February 3rd or ４th is called 立春 ( = risshun) and it is the day when spring starts and also it’s a beginning of a new year in Japanese lunar calendar. 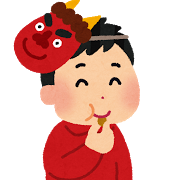 What do we do on 節分 ( = setsubun)? = Oni wa soto! Fuku wa uchi! This will get rid of bad luck and invite in good luck. One person, usually a father, wears the 鬼 ( = oni) demon mask and the rest throw beans at that person. It’s customary to pick up the beans off the floor and eat the number equal to your age in the hope that this will get you good health and good luck. 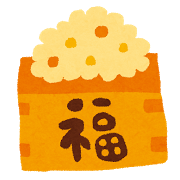 A lot of shrines or temples hold a 豆まき ( = mamemaki) throwing soybeans event. Some of the big shrines or temples have celebrities as guests to throw beans to crowds. 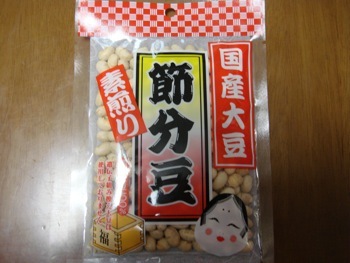 ↑The above picture is 節分豆 ( = setsubun mame) You can buy these roasted soybeans before Feb.3rd. 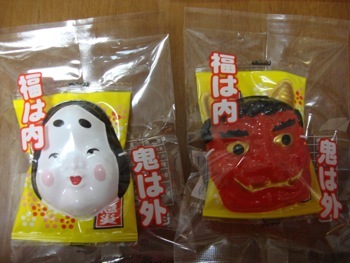 ↑Some of the packages contains masks of 鬼 ( = oni) demons. The one on the left is おかめ ( = okame) which represents 福 ( = fuku) good luck. You can see that the packages say 鬼は外、福は内 ( = Oniwa soto, fuku wa uchi) Demons out, Good luck in. 立春(=risshun) the day when spring starts in Japanese lunar calendar. We eat 恵方巻き ( = ehoumaki) on 節分 ( = setsubun) which is a thick sushi roll. 近畿地方 ( = kinki chihou) = Kinki area (in the West part of Japan). でんぷ ( = denpu) pink colored fish powder), etc. There is no specific rule for the ingredients but they represent the 七福神　( = shichifukujin) Seven Deities of Good Fortune. 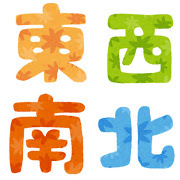 Every year has a different good luck direction called 恵方　( = ehou). Cf. We also use 吉方(位) ( = kippou(i)) for good luck direction. This year 恵方 ( = ehou) is 西南西 ( = seinansei) west-south-west. You are supposed to eat the sushi roll on the night of Feb. 3rd but you are not supposed to cut it. This is supposed to help you not “cut” the good relationships = 縁を切らない ( = en wo kiranai). Now, I will teach you directions. = Kiri de nanimo mienaku nari hougaku ga wakaranaku natta. = I couldn’t see anything for the fog and lost my bearings. = Watashi wa fuusui wo shinjite iru node kotoshi wa higashi no hougaku niwa ryokou ni ikanai. = Since I believe Feng Shui, I won’t travel in the direction of east this year. = Nihongo wo manabu yoi houhou wa arimasenka? = Is there any good way to study Japanese? •方向 ( = houkou) direction, trend, stream and etc. Note : 方向 ( = houkou) is a synonym of 方角 ( = hougaku) , direction or bearing, such as North, East,West, South, etc. 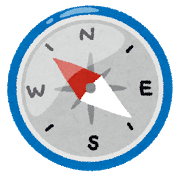 It also has a meaning of a direction that people or project proceeds. = Tadashii houkou ni susumu. = to proceed in the right direction. = Soko no kado ni yakkyoku ga arimasu. = There is a pharmacy on the corner. • 関西弁 ( = kansaiben) Kansai area accent. • 南向きの部屋 ( = minami muki no heya) The room facing south. • 北枕 ( = kitamakura) to put the pillow toward north. Culture note : Some Japanese people avoid 北枕 ( = kitamakura) because of the old custom of putting the deceased person’s body facing north. =Kare wa toukyou ni kitabakari de nishi mo higashi mo wakaranai. = He has just come to Tokyo so he has no idea where anything is. どっちでもいいのに ( = docchicemo iinoni ) I don’t care whichever/whatever it is. = Mina wa kotoshi wa mamemaki wo shimashitaka? Watashi wa jaakii wo nagete moratta houga ureshiindakedo..
= Did you throw beans this year? I prefer you throw doggie treats! Thank you, zoheb for checking the spelling as always. Really appreciate it! ジャーキー= jaakii is a dog treat which came from beef(or chicken/pork) jerky for dogs. Setsubun is such a cool tradition^^ I admit I m chotto 方向音痴 .__. Haha, I am VERY 方向音痴 as well! Hope a lot of 福 comes to you! itsumo tasukete kurete arigatou : Thank you! And it’s a perfect sentence! You are my favorite student!! I loved the video, and would love to win one of the masks. very interesting stuff, thanks for all the great info. Another brilliant lesson. What fun! This lesson was extremely helpful! Also, I’ll have to teach the Pugs to have a taste for Sushi too! Hehe! I thought I’d add my youtube address for the drawing. Sorry for the multiple comments, well if that could help I’d comment more too lol. Thank you for the correction! Hope you come visit me more often here! If you have a request or questions, please feel free to ask me! Next year I’m going to share a sushi roll with my dog Loki in honor of this video! Thanks for this lesson. This is a really interesting tradition. I saw the video you made on gimmeaflakeman channel! Maggie stole your ehomaki! More luck for Maggie ahhaha! ^_^ Please enter me in the random draw for the setsubun prizes. Thanks! What happens if there’s not enough beans left on the floor to equal your age? Do you end up with bad luck for the year? Thanks for the lesson and making me hungry. Usually we throw loooots of beans so there we don’t need to worry about that. But if there are not enough…just throw more beans! Thank you for the great lesson Maggie-sensei!! Haha, this is actually a really great way of learning. It is not designed towards beginners however it does break down the sentences and information very well for studdy. After finding this page after your youtube advertisment, im sure i will keep poping back to try and educate myself alittle bit more. ^^ – Jay. Great video on Setsubun! Please send me the Setsubun pack! Onegaishimasu!